Just had to share that the new issue of Every Day with Rachael Ray hit my mailbox yesterday! This one looks like a keeper too, with grilling recipes and entertaining tips. I am going to do my best to save it for my road trip to Yosemite this weekend, but I am not sure that I have the willpower. I wonder how much longer we have to wait for it to be published every month (instead of every other month)? I will make sure to do some posts about the contents of this issue for those of you who haven't gotten a subscription (yet)! I'm behind the times... I just put the last issue last night.. and I was very excited. I had to go to a special magazine store because not many of the stores carried her magazine. Dumb, lol. Carrie! You are disappointing me! 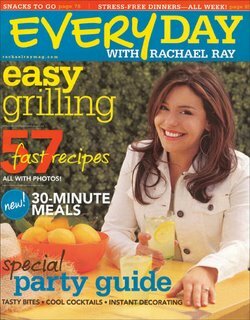 You can still get the charter subscription for 18 bucks at www.rachaelraymag.com. At first I was disappointed because they put EVERYTHING from the magazine on the website, which made me wonder why I was paying 18 bucks a year for it. Maybe they were trying to introduce people to the magazine? But now they are much more selective, so it is worth it. He he, I do dig Rachel Ray. Elise directed me your way. Nice to see another Sac Area blogger! I know, I know.... BUT I couldn't find anything that said how much it was to Canada!! Thanks for the Welcome, Garrett! Alright Carrie, I will give you a pass for a little while becuase of the whole "Canada" thing. They actually added it to the magazine rack in the checkout lanes at my grocery store. I assume that is a big step for a magazine.